I guess I'm about just about finished with this guy. His backpack, weapon, banner and the base are all that's left to do. For some reason he's not coming out well in photos. If I can get a good close up, I'll post that. This is my first time using the GW washes and I must say they are a real pleasure to use and their effect is nice. Thanks Peter, each wash definitely has it's place. Some are better than others for certain things I'm learning. I'll have a couple finished pics later this week. Looking very good indeed. Can't wait to see him done! Yeah i use the washes and they are brilliant. Badab Black wash has so many uses and ive started layering with washes too... example.. i base coated a marine with blazing orange then used baal red wash into every recess, i was quite heavy with this so that it spilled onto the actualy armour panels edges, then gave a wash of badab black into the recesses being a little more presise... after that i just touched up the armour panels leaving a slight amount of the stained baal red parts on the edge.. that process is a little "backwards" but the inks natually blend well and when the marine is highlighted it looks like a lot more time has been spent on him. as for the nurgle sorcerer, he is quality, i love the real grimey look to him, a lot of nurgle paint jobs can be bright but he looks properly filthy... excellent work mate. is the weapon going to be clean or rusted... a rusted blade would look brilliant on this guy. Vinci76: The weapon is definitely rusted. I gave it a wash of Sepia followed by some stippled rust color around the hilt. Then I went over just the tip with a bright silver to highlight the edges. Lastly I did a mud wash around the hilt to make the grime look built up some. I don't know if I have a good pic of the blade itself. The model has already been handed over to it's owner. im going to try to pick up the whole set of washes at some point. nice effect for little time for sure. i love this model too btw. 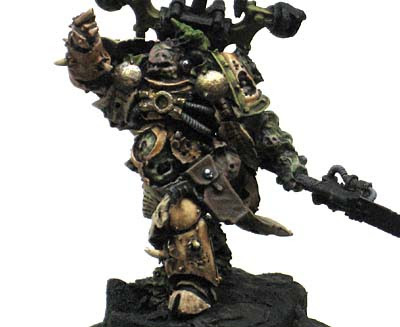 man, just this and the terminator upgrade make me want to make a lil nurgle force. Nice work Ron, it looks very good. Hi Ron - the miniature looks great!! I'm not sure if it is the photo - but is his face a shade of purple? jabberjabber: His face is a mix between warm and cool greens. In this picture, more of the pink is coming out. I went back and forth with trying to shade with cool colors and highlight the face with warmer tones. There is some purple in the shadow areas but the final face doesn't have as much "pink" and has more of a green tone. You're an amazing painter Ron. I truly enjoy looking at your models. Keep up the great work. Thanks oni, I still need to work on my use of washes and combining them with the techniques I use already. The Sorcerer was the first model I did that looked like a "GW" model when I was done painting it and not so crisp and clean like my stuff has looked so far. I'm hoping to perfect it a little more when I get around to starting my Eldar.